If there is a musical ensemble that truly belongs to Cambridge it is the Endellion String Quartet. This year they celebrate an amazing forty years of collaboration - music making in the city where they are uniqely tethered by their own history . Over the years, the Quartet’s schedule has included regular tours of North and South America and concerts in Australasia, the Far East, Middle East, South Africa and Western Europe. Everywhere, the Endellion String Quartet ‘sets the audience ablaze’ (Daily Telegraph) and ‘captivates concertgoers with a remarkable rapport, playing to each other with a sense almost of discovery, communicating to the audience on a level of unusual intimacy.’ (Guardian) Their range of concert halls is immense. There have been appearances at Carnegie Hall in New York, Queen Elizabeth Hall in London, Amsterdam’s Concertgebouw, Zentrum Paul Klee in Bern, International Festival of Music in Tarragona, Montreal’s Pollack Hall and a tour of Mexico, including a performance at the Festival Internacional Cervantino. And here at home they are regulars at the Wigmore Hall and as artists in residence for Cambridge University based at West Road . “The Endellion is arguably the finest quartet in Britain, playing with poise, true intonation, excellent balance and a beautiful tone.” And the Endellions are innovators. 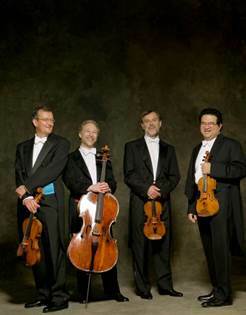 They work with other musicians, Stephen Isserlis, Sir Thomas Allen, Mitsuko Uchida have all accompanied them. And poets have shared the stage with the famous foursome. Andrew Motion wrote an entire sequence of powerful stanzas to accompany their version of Hayden’s Seven Last Words of Christ and Ruth Padel ( a descendant of Charles Darwin and poetry prizewinner) has given her own version of the same work. In their eclectic matrix of music, nothing stands still. Their concerts are executed with unfailing skill. But sometimes the logistics of a group of travelling players interferes - the risk of disaster is quadrupled when four musicians must make their way armed with instruments to places they often have never been before in foreign lands. . Live music-making is already a thrill seekers’ attraction. The precision of remembering notes, ‘so many of them’ as Garfield once remarked, is a high wire act in itself. But when you add the threat of their not turning up together at all, it adds another hidden frisson. On one night in Cambridge disaster nearly happened. Ralph de Souza , the Endellions’ inspired second violinist was stuck on the Mill Road into town in a mire of traffic. Where the group normally have four hours to prepare and rehearse before any concert, this meant Ralph had five minutes to dress and come on whilst a sympathetic audience waited. – and cheered with relief when they saw him. The night Ralph nearly didn’t arrive is still remebered by Endellion fans. And then he was suddenly announced. The audience felt an added thrill of relief when , only fifteen minutes late the virtuosic players took their place on the stage. It underlined the fragile nature of what live music is all about. And it showed how a lifetime of discipline, hours of rehearsal each day and a true dedication to their art have brought this group to their place as the foremost place in international music-making. The Endellions have recorded the entire Beethoven quartets a full ten years ago so this is familiary territory to remind their loyal fans, and inform their new audience . Beehoven has always been a staple, as has Haydn, of Endellion concerts and with Tchaikovsky this concert is emblematic of their abiding love ot these threes titans, and a gesture of appreciaiton to an audience who whilst they often love innovation, thrive and delight in the the classic combination on offer this week. ‘Like Beethoven, Tchaikovsky was a great symphonist and an equally great quartet writer. The small forces of the string quartet never seem to hamper his capacity for sumptuous harmonies and textures. The slow movement of this piece has become justly famous and is transcribed for orchestra and other instrumental combinations. Haydn’s profound and searching Op.20 No.5 ends in a fugue as does Beethoven’s famous C major quartet ‘. Other concerts will follow to note this triumphant 40th, and they all continual to be unmissable.